I love it when a TV show totally takes you off-guard and surprises you in a great way. That's what watching The Fades was like for me and Tobie. To be fair, we had little to no idea what the show was about other than it was something new that had just started, which is always a nice time to tune in. The basic synopsis of the show online showed some promise so we took the gamble and watched the pilot. And while it wasn't the strongest pilot in the world, the show presented some very strong potential to be an even greater experience. I suppose the main draw for us was how a lot of the show's concepts almost felt like something you'd encounter in the types of White Wolf role-playing games that we regularly engage in with friends. They had similar concepts and even similar tropes at work but with a rather interesting story tying everything together. This show had a much stronger resonance with us even when compared to other British productions like Misfits (which we continue to enjoy as well). And I'm glad that we embarked on this particular 6-episode adventure. The Fades is a supernatural drama series created by Jack Thorne and broadcast on BBC Three. Jack Thorne also handled the writing for all six episodes. The central figure of this series is Paul (Iain de Caestecker), you're average 17 year old for the most part except for the horrifying apocalyptic dreams he keeps having. The dreams are vivid and real enough to him to make him wet his pants in his sleeps every time the dreams happen. Eventually he and his best friend Mac (Daniel Kaluuya) witness a strange incident at an abandoned mall of sorts where some sort of creature attacks a man we later discover to be Neil (Johnny Harris). Neil eventually reveals to Paul that he is an Angelic, who have the power to see the spirits of the dead that still wander Earth that are known as the Fades. They're sort of like ghosts in a traditional sense but not quite that either. And it seems the Fades have discovered a way to become corporeal again to a limited extent, at the cost of human lives. Thus Neil takes it upon himself instruct Paul in the ways of their group given his ability to perceive the Fades proves he's also an Angelic. Paul however just wants to get through life as normal as possible despite his social awkwardness. Initially the tone of the show did feel a tad confusing given how heavy the drama side of things is with Mac playing the comic relief contrast. And it's a major contrast mind you given he later provides a quick synopsis at the beginning of every episode that seems inconsistent with the somber reality of the challenges they face. Like many shows of this nature with such a limited amount of time to tell a story, the action and the potential consequences of said actions comes fast and hard at times. No character is sacred and you can expect major characters to die in almost every episode. And that helps keep the story tight and the reality of the situation rather palpable. After all, how can you truly depict a story about supernatural terrors if people don't die throughout the run of the show? No deaths = a story made "safe" for TV. The show has quite a number of compelling characters and it's hard to go into why they work so well without potentially running into spoilers. One that truly stood out was Helen (Daniela Nardini), who is one of the Angelics. She is dressed as a preacher although how this plays into her actual life in the show is never fully established. But what is cool about her is how well she depicts a strong female role in the story without the need to make her overly masculine. She contrasts well between vengeful and caring as needed and she certainly added a nice bit of edge and attitude to the show. Paul is an interesting protagonist as well. Sure, you can feel how he's shaped by the classic path of the Hero's Journey in terms of his character development, but it still works. He's not 100% naive nor is he unrealistically brave either. He has a general sense of acceptance about him given the situation and the unusual circumstances but he makes the most of things in terms of trying to push forward in a manner that allows him to still live with himself at the end. And he totally rocks his abilities without needing to go into the juvenile "testing the limits of ones powers" - instead we have him as surprised as we are when his abilities manifest during key moments. The whole show is a great piece of supernatural storytelling with a dash of horror mixed in. It's smart, witty and feels a lot like White Wolf's Orpheus in many ways. And despite how "epic" the story seems to be, it still wraps up rather neatly at the end of the 6-episode arc with the promise of even darker things ahead should this show continue on. 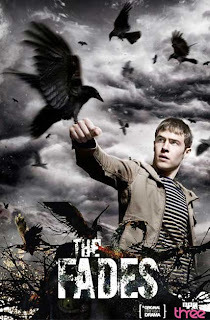 The Fades is one of the best new shows I've seen in a while and I firmly rate it at 5 surprising moments of Paul discovering his abilities (truly a BIG FINISH right there) out of a possible 5. Ack, sorry about that. Instinctive habit to lump all British television together.